A friend asked me about the significance of #tpnstrong. She had noticed that I always include that hashtag on all of my social media posts. 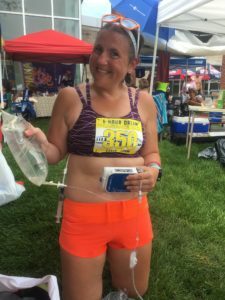 I explained to her that in 2011, I got really sick and my gastrointestinal system stopped working normally, so or the past 7 and a half years I have received the majority of my nutrition through a special intravenous (IV) line in my chest. This IV nutrition is call total parenteral nutrition (TPN). A few years ago I was playing around on Instagram and was searching hash tags. I searched TPN, EN (enteral nutrition), tube feeding, IV nutrition, and other similar terms trying to get a sense of what things would come-up. I think now with social media so prevalent, whenever there is something new we go to the internet to read about it. As I was searching, I was thinking about the patient or parent of a child new to TPN trying to find out what a life on TPN would be like. I was greatly disappointed that all of the images that I found tagged were “sick” pictures. For example a woman in the hospital bed with TPN, a boy lying on a couch looking sick, etc… I decided that I was going to try to flood social media with pictures of me doing normal things. Anytime I post a picture on social media, I tag it with #tpnstrong. I want to show people new to TPN that you can live a full life and thrive on TPN.